In this chapter, we will continue focusing on split-plot designs. However, we no longer assume that the number of whole plots and the size of the whole plots are dictated by the experimental situation. Instead, another type of restriction is imposed on the split-plot design: only one whole plot is connected to each combination of the hard-to-change or whole plot factor levels. 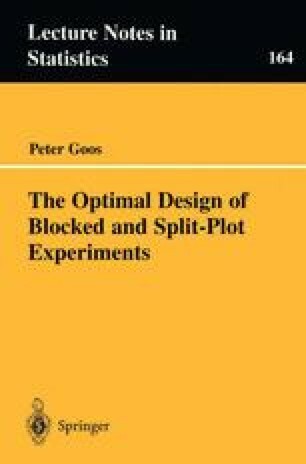 A typical example of this sort of split-plot design is the prototype experiment, where exactly one prototype is built for each combination of the whole plot factor levels.